Instant Pot Cream Cheese Spaghetti–spaghetti but a whole lot better. A ground beef sauce is served with spaghetti noodles and then cream cheese is stirred in for an ultimate creamy dinner. Kids and adults love this spaghetti! 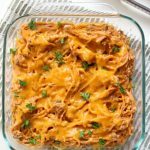 If you’re a fan of cream cheese you’ll love this recipe for Instant Pot cream cheese spaghetti. It’s all the goodness of spaghetti but better with the addition of cream cheese and a sprinkling of cheddar. If you aren’t looking to serve a crowd this recipe can easily be halved. Just cut all the ingredients in half but keep the cooking time the same. This is a good recipe to make for a neighbor or friend. Just pile the spaghetti into a glass baking dish and sprinkle with the cheese and then stick it in the oven to melt the cheese. 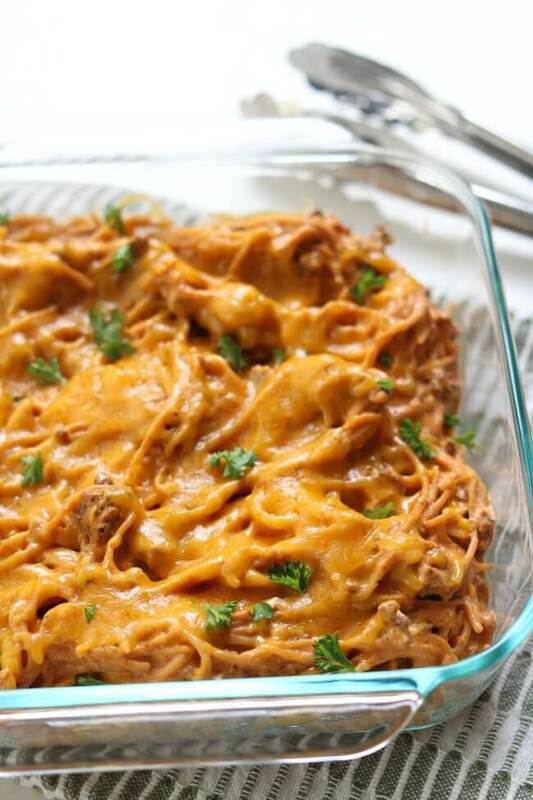 It looks like a fancy time-consuming casserole but really it only took you 15 minutes. Add a salad and some garlic bread and you’re all set. To make Instant Pot Cream Cheese Spaghetti I used my 6 quart Instant Pot Duo 60 7 in 1*. I love this Instant Pot because it has the yogurt making function which I use almost weekly. It has two pressure settings (high and low), and there are also little slots in the handles so that you can rest the lid there instead of putting it down on your counter-top. Spaghetti but a whole lot better. 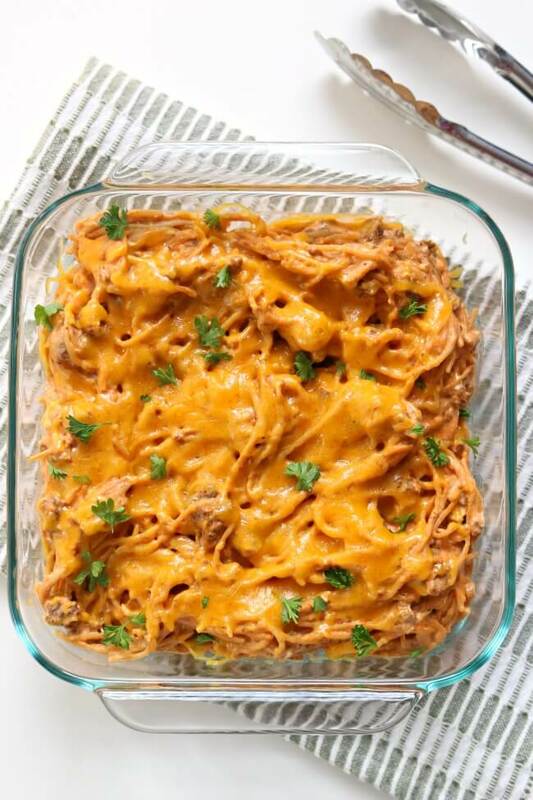 A ground beef sauce is served with spaghetti noodles and then cream cheese is stirred in for an ultimate creamy dinner. Kids and adults love this spaghetti! Turn your Instant Pot to the saute function. When the display says hot add in the ground beef. Break the meat up with a wooden spoon. Sprinkle in the salt and garlic powder. Brown the meat. Drain off any excess grease. Pour the water into the pot. Break the spaghetti noodles in half and add them into the pot. Pour the spaghetti sauce on top. Stir in the cream cheese until it is melted. Sprinkle the cheddar on top and serve. Like this recipe for Instant Pot Cream Cheese Spaghetti? Get all my new recipes delivered to your email inbox by signing up below. This is the best spaghetti I’ve ever had! The noodles cooked perfectly and the creaminess is amazing. Subscribing to your blog now! Hi! I’ve made the recipe and we love it! Could you help me adopt it for regular spaghetti and frozen meatballs without the cream cheese? The other recipes that I have tried come out with watery sauce, and not enough noodles (half a box) to feed our family of four. I use a 6 qt Instant Pot. Thanks for any help! Hi Tara, I have had the same issues as you! I need to try again. I’ve tried like 3 separate times and it never turns out well for me. Do you put the ground beef back in with noodles? I make this recipe all the time in the insta pot. It has become a favorite in my house. After it’s done I put it in the oven with cheddar cheese on top till it melts and browns. Nice! So glad you like it! If I substitute Zoodles for the spaghetti noodles you suggested to not cook the Zoodles in the Instant Pot. Would the 3 cups of water written in the recipe be totally eliminated as well? 1. Turn your Instant Pot to the saute function. When the display says hot add in the ground beef. Break the meat up with a wooden spoon. Sprinkle in the salt and garlic powder. Brown the meat. Drain off any excess grease. 2. Stir in the zoodles and spaghetti sauce. Heat through using the saute setting. Add in the cream cheese in little chunks and stir until melted. Add in the cheddar and serve. Would this recipe work to substitutie Zoodles for the pasta? I would not cook zoodles in the Instant Pot because they will get overcooked. You could however cook them on the saute setting. This is my first recipe I’m trying with my brand new Instant Pot. I am using 1 lb. Ground beef and 24 oz. Sauce, as stated in the recipe. But only 8 oz. (1/2 lb.) noodles. Should I half the water? This was the easiest thing I have made in a while. It was really good! I substituted already cooked chicken breast for beef. And it was still good! I had large clumps of undercooked noodles in spite of trying to stir them around before cooking. What did I do wrong? Hmmmm, I’m not sure! Was is spaghetti? Not the original poster but I also had this happen to me. I just stirred the spaghetti and left the uncooked noodles at the bottom, closed the lid and left it in there for another 5 minutes. After that everything was good. 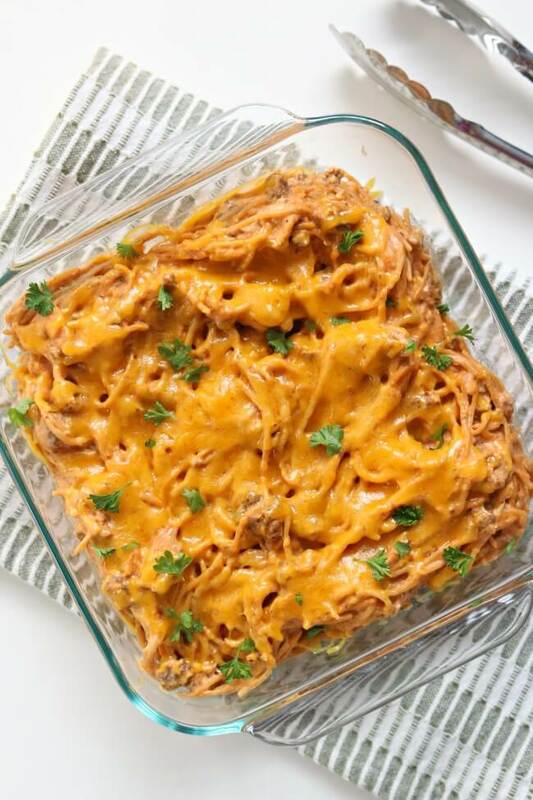 Karen, I have someone in my household that has acid reflux, so no tomatoes–I used chicken breasts that I browned-added garlic powder, Italian spices to meat, same water, spaghetti, one can of mushroom soup, one can of cream of celery instead of marinara sauce, then added cream cheese and cheddar cheese. It was delicious. I also added some broccoli and sautéed onions. I will add some mushrooms next time. Thank you so much for all your recipes! I love each and everyone I’ve tried (5-6 so far). I made this dish with marinara last weekend and then tried one of the commenters suggestions to sub cream of mushroom and celery this weekend. Both were delicious and fed my family for multiple nights! Thank you. Did you brown the beef first? And do you think this would work with frozen ground beef? In the first step I did brown the beef. I would cook the frozen meat for 5 minutes on a trivet with a cup of water in the bottom. Then I would brown it and follow the recipe as it is written. Walked in from work at 5:10 and was eating dinner at 6 p.m. Really good and fast and hubby approved. I had some WW zero point marinara in the freezer that I used for the spaghetti sauce and subbed 1/3 fat cream cheese. It was all very good and since there are only two of us, I have a container for another meal and a container for the freezer. Thanks for another keeper! That is fantastic Brenda! I love it! Could you tell me your preference in spaghetti sauce? I am not picky but I do like the Classico brand. Cannot wait to try this one – looks perfect for a busy weeknight. Thanks again for all the wonderful recipes! People that don’t like cream cheese are not my people. How would you recommend cooking this if you don’t have an instant pot? I would do it on the stove top. Boil the noodles and drain. Brown the meat in a skillet add in the noodles and sauce. Stir in the cream cheese. Very easy! Can this be done instead with a slow cooker? If so, at what temp, and how long for cook time? Thank you! How much water do I use if I reduce all of the other ingredients in half for 4 servings? half the amount of water too. So 1 1/2 cups.